This is the original version, introduced in 1955. The inside is hollow. This is the original version, introduced in 1958. The brick walls are slightly thicker and flat, and the single tube stands alone, without any connection to the side walls. This is the modern version, introduced 1985. The brick walls are slightly thinner, with two inside ridges on each sides. The mold comparison image shows the two most common versions. If unsure, use the modern version 3003. Earlier alternate versions had no buttom tubes and were slotted (bslot02, bslot02a and bslot02b: 1949-1955). LEGO mapping includes Design ID 6223 for transparent [PC] parts, 62404 and 15591 for Metallic Gold version. Click on a colored part below to see the Sets and MOCs that use part 3003 Brick 2 x 2 in that color. You can find an overview of all LEGO Colors here. 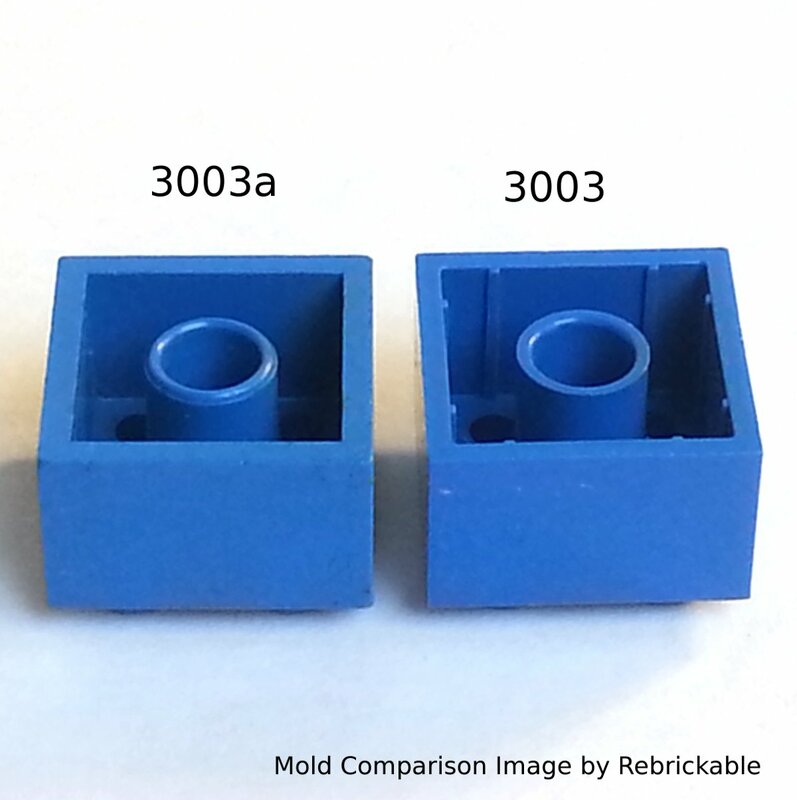 There are 3 Mold variations of part 3003 - Brick 2 x 2 in the database, in use between 1985 to 2019. See Molds and other related Parts.